Lenovo's ThinkPad Tablet 2 runs Windows 8 Pro on hardware that's small, light, and perfectly suited to a mobile user's needs. However, because it's an Atom-based tablet, its performance isn't great, and you might get frustrated if you try to do too much with it. Lenovo's ThinkPad Tablet 2 is one of the thinnest and lightest Windows 8 devices on the market. It's a 10.1in tablet that weighs just 558g and it runs an Intel Atom Z2760 CPU. Think of it as a basic device on which to perform simple office tasks: check email, view Web sites, type up documents, and edit small spreadsheets. And you'll have the freedom to run any Windows programs that you're already used to — as long as they don't demand lots of CPU power. Being a ThinkPad product, it's aimed more at business users than the home crowd, but you could still buy it if you wanted a basic Windows-capable tablet for the home. The Intel Atom CPU, which is joined by 2GB of RAM and a 64GB solid state drive (SSD), doesn't provide too much speed, so it could be frustrating if you plan on doing a lot of multitasking and media tasks on the tablet. It's a tablet that's best suited to doing one thing at a time (for the most part), and it's not really designed to be a full-blown content creation device — get an Intel Core-based tablet for that sort of stuff. Physically, the Tablet 2 is only around 10mm thick and it's very easy to handle. The screen has a 1366x768 resolution, though it's not very sharp (and this will be noticeable in photos), and Lenovo supplies a digitiser pen for it, which sits neatly in the side of the unit. This means that you can use the Tablet 2 easily write down notes using Windows 8's built-in handwriting recognition; you're not limited to just using your fingers and tapping things out on the on-screen keyboard. It recognised handwriting quite well during our evaluation period; we were able to quickly jot down sentences and insert them into open documents. If your writing is really messy, then the recognition won't be great, but if you can write in anything more legible than scribbles, you'll get good results. The screen is bright and this helps to counter any reflections from its glossy fascia. The downside to the high brightness is that it will eat into the battery life. In our battery tests, in which we maximise screen brightness, enable Wi-Fi and loop an Xvid-encoded video, the ThinkPad Tablet 2 lasted 5hr 34min. That's a fair result for such a thin and light Windows 8 device, and you should be able to extend that noticeably by using a lower brightness. How long you get will depend on the tasks you undertake, and how hard the CPU has to work. Our video used up about 13 per cent of the CPU for the most part, but tasks such as Web browsing can take up 50 per cent or more of the CPU if running Flash elements, for example. 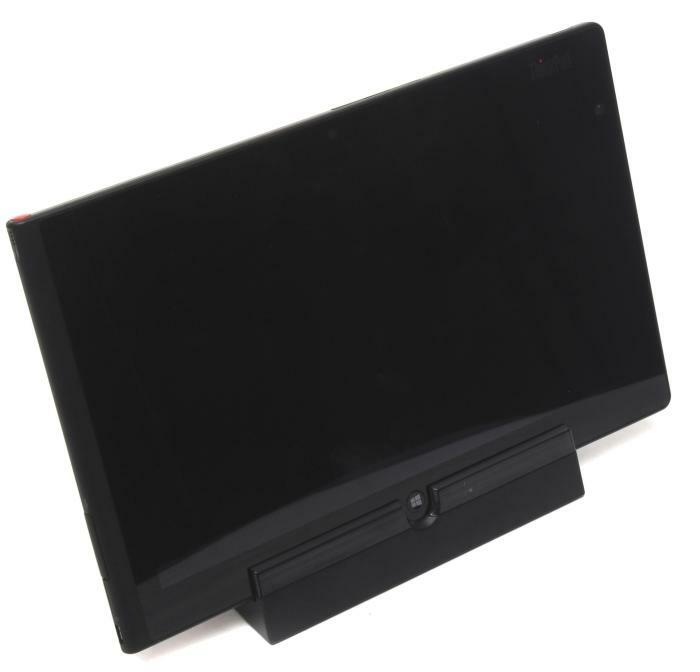 The Tablet 2 has a range of optional accessories, including a dock, keyboard stand, and a VGA dongle. Some tasks will bog the CPU down so much that the application you're using could stop responding. In particular, Firefox didn't work too well on this tablet, especially when trying to load 'heavy' Web sites such as Flickr. The best experience we had with this tablet was using native Windows 8 apps in the Modern UI. Browsing the Web was best done using the Modern UI version of Internet Explorer, both in terms of reliability and also user friendliness — if you tap on text boxes, for example, the on-screen keyboard will always pop up and the screen will be re-positioned to facilitate the entering of text. As far as benchmark performance is concerned, the Intel Atom Z2760 recorded 3min 36sec in our Blender 3D rendering test, which is over 15sec slower than the Dell Latitude 10 and HP ElitePad 900 tablets, and only a 24sec faster than one of the last netbooks we saw back in 2010, the Acer Aspire Happy. In 3DMark, the Ice Storm test, which is the most basic of the tests that's designed to run all types of machines, recorded 2279. This makes the Tablet 2 capable of running only simple games from the Windows Store. For comparison, a laptop with integrated Intel HD 4000 graphics gets about 40000 in the same test. In CrystalDiskMark, the 64GB solid state drive recorded a read rate of 80.44 megabytes per second (MBps) and a write rate of 34.54MBps, which as slow as we expected from a device in this class. We also ran a few browser tests, just to see how the Tablet 2 compares to other low-power devices, including Chromebooks (Acer C710, Samsung XE303C12), a Samsung Galaxy Note II smartphone, a Nokia Lumia 925 smartphone, and one other Atom-based tablet, Dell's Latitude 10. We used Firefox for these tests (as we did for the Dell), as it proved to be faster than Internet Explorer, but you can see that it's still slower than what the Dell achieved in all the tests. As we mentioned earlier, though, our real-world experience differs slightly from these test results, insofar as using Internet Explorer in the Modern UI proved to be a better experience than using Firefox on the Desktop. If you want to use the Tablet 2 for productivity, then you might want to consider a couple of the options that are available, including the ThinkPad Tablet 2 Dock and the ThinkPad Tablet 2 Bluetooth Keyboard with Stand. The dock is most useful as it adds two USB 2.0 ports, HDMI, Gigabit Ethernet and audio ports, as well as power via a bigger adapter. The tablet sits in this base and interfaces with it via the connecter on the bottom of the tablet, but when you lift the tablet, it takes the dock with it. This is unlike the dock that's available for HP's ElitePad 900 G1 tablet, for example, which sits sturdily on the desk even when you take the tablet off it. Sitting in the keyboard stand. The Bluetooth keyboard also has a stand for the tablet, but it doesn't lock the tablet in place. If you forget this fact, and you pick up the tablet from its keyboard stand, then the tablet could topple over and drop to the floor. It's a somewhat odd design. We can't help but think that a combination dock and keyboard accessory would better serve a tablet like this. Without these accessories, the Tablet 2 offers one built-in USB port, which is a blessing for a tablet so slight, in addition to a microSD card slot so that you can add more storage, and a Mini HDMI port for video output. Models with built-in mobile broadband modules are also available, but for 3G only. Our test model had the SIM slot, which is located right next to the microSD card slot, but it didn't have the broadband module installed. The power button is at the top, the volume and auto-rotation lock buttons are on the right side, and the Micro USB port for charging the Tablet 2 via a wall wart adapter is on the left side. You also get dual-band Wi-Fi, Bluetooth, two cameras, and TPM 2.0. There is a built-in USB 2.0 port on the side, and a micro-USB port is used for charging. Volume, rotation lock, and power buttons. The bottom has the docking connector and the Mini HDMI port. The model that we looked at (64GB, Wi-Fi) costs $759 in Australia ($1069 in New Zealand). There are more expensive models that also have 3G and NFC. The dock accessory costs $129 in Australia ($159 in New Zealand), while the Bluetooth keyboard costs $149 in Australia ($194 in New Zealand). 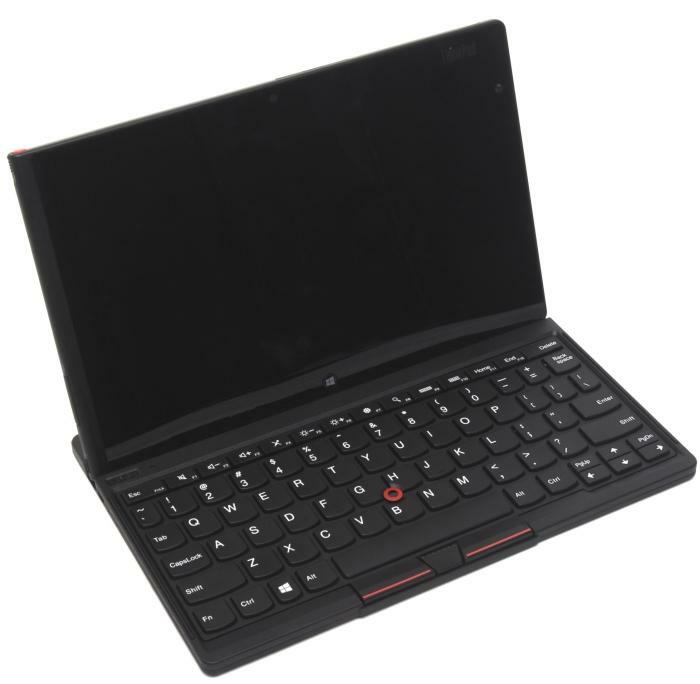 You should only consider the ThinkPad Tablet 2 if you have a pressing need for a fully functional Windows 8 tablet that is very thin and light.